Fish are one of the most important ingredients in your pond, and arguably the most personable. They start off as simply fish, but usually, within a short period of time they transform themselves miraculously into pets, complete with names and personalities that their owners learn to love, adore, and care for. Of course the fish return the favor in spades by becoming incredibly excited when their friend (and food source) finally saunters out to pond side and begins tossing tasty pellets of flavor onto the pond’s surface. At that point Hoover, and Goldie, and Pete, along with the rest, begin churning the water in the process of going after all the food. 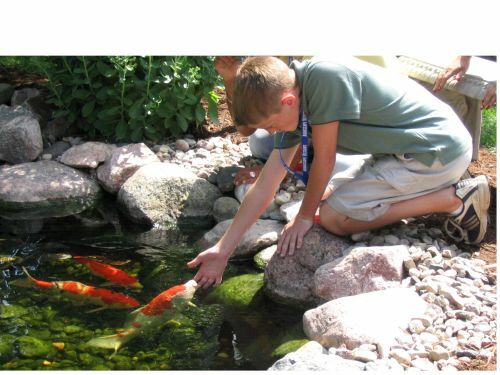 Friends of the family is what you can expect your fish to be, so you may as well learn to take care of them so that your babies all experience a good life in your pond. In at least one respect, koi are a lot like people. They don’t care much for stress, and they react to it by experiencing a reduction in the effectiveness of their immune system. This reduction in turn, leaves them vulnerable to disease and parasitic infection. When they’re vulnerable, they often become sick. The cure always involves cleaning up their environment, reducing their stress and allowing their immune system to revitalize, making them happy and healthy. So the biggest and most important job for a successful pond fish keeper is preventative in nature.